Here's the full review of the performance spectrum from upstate NY. There was some buzz about Mitchell's speed during the pre-season as being pretty dang impressive, but an injury sidelined him for the first part of the championship and he has struggled to reach his full potential since returning. 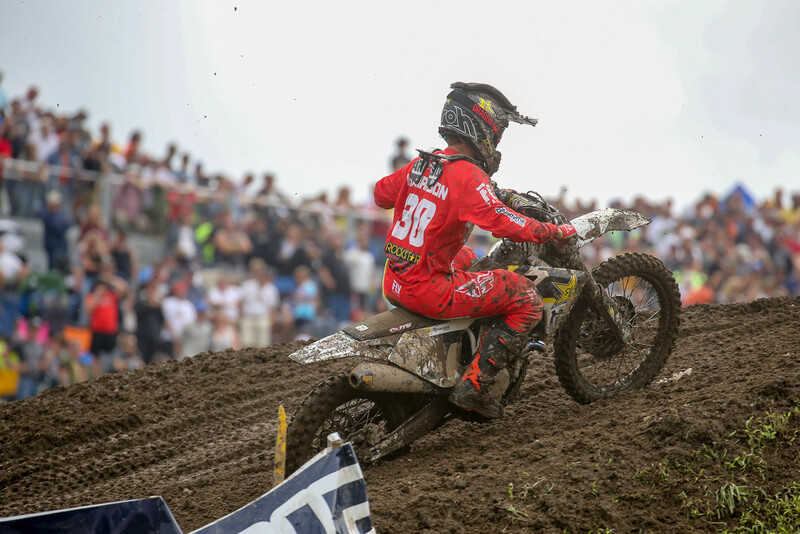 However, he proved at Unadilla that given two solid starts he is capable of racing up front and fighting for wins. This should help him in his hunt for a ride, too, as he stated during the press conference that he still doesn't have anything set in stone for next year. As I've talked about on here before, this sport is rough. A kid can have a factory ride one year and struggle to even land a support ride the next. That could very well be the situation Mitchell ends up in if he doesn't get a deal signed fairly soon. The good thing about looking for a 250 ride rather than a 450 ride is that sometimes teams are able to expand the roster by one if a decent rider is left standing when the music stops. If he's able to show some speed and secure some decent finishes at the final two rounds, I'm sure someone will be willing to sign him for next year. Many of us probably expected the mud-loving Aaron Plessinger to win the overall on the day, but the Frenchman bested him in the nasty conditions and went an impressive 1-1 for the win. Dylan never looked out of control out there and really for most of the first moto he made it look very, very easy. He did use some, uh, creative lines at times, but it seemed like the officials were being a bit more lenient due to how unpredictable the conditions were. The second moto took a little bit more work, but he capitalized on Mitchell Harrison having an issue with a lapper and just flat out made the pass happen on Plessinger for the lead. A well-deserved win, and now I really can't wait to see how he does at the Motocross of Nations against the 450s. I wouldn't be surprised to see him fight for podiums in his motos. A bad start in moto one and a good start with a crash in moto two led to a very "meh" day for Jordon Smith. Of course, it's hard to rag too hard on a guy for having a rough day in the kind of conditions we saw on Saturday. And, to be fair, he has come around as the season has gone on and has shown that he does have the speed to run up front, but consistency is still an issue for him. He has become very good at Supercross over these past two years, though, so maybe outdoors is where we'll start to see some improvement next. For a mudder, the racing at Unadilla was pretty great. We actually saw some battles between the top guys and it wasn't just an absolute crash-fest. 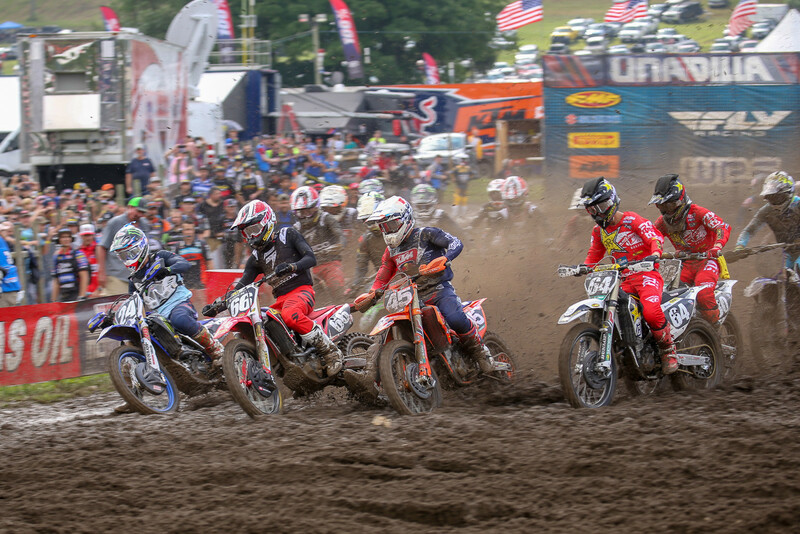 But, I was a bit disappointed because I generally think of Unadilla as one of the best tracks on the circuit to watch the guys race on, and we already had a mudder there last year so I was hoping for a reprieve. Mother Nature doesn't really care what I think, though, so it poured (although not as bad as last year). But, like I said, the racing action was almost on par with a dry race and I know some people actually hope for at least one mudder a year...so I guess I can't be too bummed about it. Not only did Filthy Phil secure his first podium in a few years at his hometown race, but he did in the mud! In a class that has become pretty predictable as far as the weekly overall podium goes, it was awesome to see someone different, aka Phil, up there. He seemed very excited about it, too, which isn't an emotion we're used to seeing from him. Will this podium help his chances of landing a ride next year? You'd think it would, and I hope it does, but he seemed pretty unsure of everything during the press conference. He even said that this could be his last trip to Unadilla depending on where in the world he ends up racing next year. I know Steve Matthes mentioned at some point during the year that some Canadian teams were going after Phil pretty aggressively, so maybe that's what he was alluding to. Honestly, he's at a point in his career where he should probably just go wherever he is being offered the most money to race, whether it be Canada or elsewhere. Plus, he'd probably be a title contender in somewhere like Canada, which would be pretty awesome to see. Team USA finally confirmed the team roster for this year's Motocross of Nations before the motos started on Saturday, and I'd say it's our strongest team in several years. We have Eli Tomac in MXGP, Aaron Plessinger in MX2, and Justin Barcia in Open. Eli was on rails at the RedBud round of the championship this year, but his bike did let go in the first moto and then he struggled in the second moto. But, he did show some serious speed, so as long as he doesn't Tomac himself he should be contending for moto wins. Aaron Plessinger dominated the 250 class at RedBud this year and should do very well in the MX2 classification, and as I said above I wouldn't be surprised to see Dylan Ferrandis running up front with him even with the 450s thrown in there. Justin Barcia loves RedBud and he really seems to enjoy representing the USA at the Motocross of Nations, so you know he's gonna give it everything he's got. This year isn't without equally as impressive competition, though. The Netherlands, France, and Great Britain will all be very strong. It should be a great event assuming the weather cooperates. It was a rough day for Kenny, who ended up coming away with a bit of a bruised and swollen arm from the tumbles he took during the motos. As he said on his Instagram, though, he hasn't raced in the mud in quite a long time and it's not easy to just jump back into those sort of conditions. Crashes in the mud, no matter how small, often lead to quite a bit of lost time. That seemed to be the story of the day and what led to his 7-7 performance. But, really, a lot of us weren't sure if he'd even be able to race anymore after the injuries he has endured over the past two years, so to consider a 7-7 performance as a rough day for him these days is actually pretty impressive. 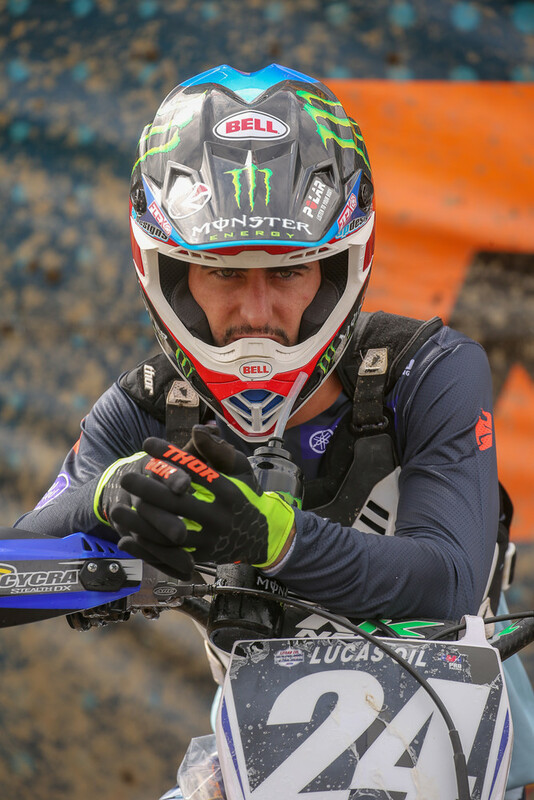 This has been talked about a fair bit since Team France's lineup was announced earlier last week, but I think the entire moto community, whether you're a Marvin Musquin fan or not, was shocked to see him left off of the team. I know it's very hard to compare AMA and MXGP riders and it's something a lot of us try to stay away from to not start a flame war, but does anyone really think he didn't deserve one of the 450 spots over Gautier Paulin or Romain Febvre? I understand Paulin and Febvre have been on the team for their four consecutive MXoN wins, but c'mon now...Musquin should be on the team instead of Paulin, who hasn't exactly been lighting the world on fire in the MXGP series this year. It just doesn't make any sense to me, and I gotta say the justification that they questioned Marvin's motivation for the MXoN is just flat out bogus. Nevertheless, I'm not gonna sit here and say that the team is weak now, because it's not, but it could be stronger. I thought it was a great race FOR MUD! And it was a good practice race in case MXDN turns muddy too. I do think we have a very strong team but then we had a strong team every year but like last year bad things happen and after so many wins with really no bad luck at all its bound to catch up sooner or later! As long as the team keeps there heads together we should be on the podium no problem and possibly a runaway win. i really thing Barcia is capable of smoking Tomac on this track and I do believe that if AP is on it no one can touch him too! France/Musquin thing reminds me of the AMA refusing to let Jim Pomeroy race Daytona one year, because of representing the USA racing the GPs, he did not have any AMA points and was not "qualified to race for the USA". It seems like France is telling Marvin, "if you not race in France/GPs, you are not qualified to race for France.....". Ferrandis is the fastest 250 rider out of Euro at this time so they should of picked him!